AANA Chief Executive Officer Randall Moore, DNP, MBA, CRNA, recently penned an article for LinkedIn that talks about CRNAs and their flexibility to adapt to the changing healthcare environment. In the article, Moore outlines what "zero-sum" is ("a situation in which one person or group can win something only by causing another person or group to lose it"), and how the current and future states of healthcare are affected by this. He also offers six predictions for the future of healthcare and what CRNAs must do to navigate these opportunities and threats. Learn more. In early April, the CPC Program two-year check-in window will open for most CRNAs who recertified or initially certified in 2017. The two-year check-in is the next step and the mid-point requirement in the four-year CPC Program cycle. This simple, online process should only take about 10 minutes (or less). Completing the two-year check-in is an important step as it continues your CPC compliance for the upcoming two years. By checking in, CRNAs will confirm current licensure and practice, update contact information, pay the CPC fee (same $110 as in the past), and check CPC compliance progress (Class A and B credits, and Core Modules which are optional in this first four-year cycle). 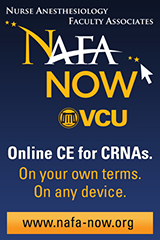 CRNAs due to complete their two-year check-in will receive an email in early April with a link to the NBCRNA login portal to begin their check-in. Get a personalized, eight-year CPC Program timeline at www.nbcnra.com/calculator, and visit www.nbcrna.com/2YCI today for more information on the two-year check-in. The Diversity in Nurse Anesthesia Mentorship Program is holding a webinar on March 12, 2019, from 3-4:30 p.m. ET, on "Greater Health Equity Through Entrepreneurship: How Nurses Are Mentoring and Innovating to Improve Well-Being for All." Hear how advanced practice registered nurses (APRNs) have improved health equity locally and nationally through mentoring and entrepreneurship to increase diversity in nursing. Be inspired by innovations that are promoting excellent, affordable healthcare in underserved communities and pick up ideas you can put into practice too. Register. You are invited to submit an abstract for consideration to present at the 2020 Assembly of Didactic and Clinical Educators (ADCE) on February 19-22, 2020, at the Chateau Elan Winery & Resort, Atlanta, Ga. The ADCE is the only forum that brings together all nurse anesthesia programs nationwide. The submission process opens Monday, March 4, 2019. On Monday, March 4, 2019, information on the submission process will be posted on the AANA website on the Call for Abstracts page. Since 1989, AANA Insurance Services has been serving the malpractice needs of AANA members by providing the broadest coverage options available through financially sound insurance carriers – allowing you to work to the fullest extent of your licensure and scope of practice. Caring has its risks. Thank you for letting us help safeguard your career. Learn more about us. According to Respect. magazine, the Black Veterans Project has a mission to preserve the legacy of the 2.5 million black veterans living in the United States. In particular, black veterans who have served in any of the U.S. military efforts from the Vietnam War to present-day conflicts in Iraq and Afghanistan. Co-founded by veterans Kyle Bibby and Richard Brookshire, the Black Veterans Project is a veteran-led, multi-organizational startup that has launched their fundraising campaign to create a full-length documentary recounting the experiences of current and former black service members. Learn more. Positions are available on AANA committees for CRNAs and student registered nurse anesthetists. Check out the committee page on the AANA website to read about the various opportunities. Deadline for committee request submissions is April 1, 2019. Please note: If you currently serve on a fiscal year 2019 committee, you must reapply for fiscal year 2020. Making a detailed list of what you own ensures that you won't overlook anything if you have to recall what was in your house, should it be lost by fire, theft or other circumstances. Nationwide shows you how. US Anesthesia Partners, the nation’s leading and largest provider of high-quality anesthesia care is actively recruiting CRNAs to join our Fort Worth Division (plus over 100+ CRNA openings nationwide). As part of our Care Team model, join a family of CRNAs, clinical providers and associates providing anesthesia support for a variety of surgeries, including general cardio/thoracic, ortho, neuro, ENT, and OB-GYN. Learn more. The Leighton School of Nursing at Marian University in Indianapolis seeks a dynamic and innovative leader to serve as the Program Director for the Certified Nurse Anesthesia Program. The Program Director is responsible for providing leadership in the areas of curriculum and program development, implementation, and evaluation of the Nurse Anesthesia Program. This person is responsible for community outreach to clinical agencies in the negotiation of contracts for student clinical placement and the recruitment of potential candidates to participate in the Nurse Anesthesia program. Learn more. 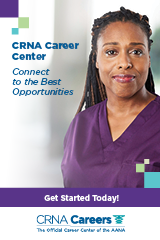 We are seeking a CRNA to work 3:12's within a Care Team model. We practice in a busy Level 1 trauma center in the northern suburbs of Chicago. Our hospital has been cited as a Top 100 hospital for many years. The practice is made up of over 50 physicians and 6 CRNAs. Our staff is highly trained and we are all board certified. We have a subgroup that supervises our CRNAs. You will be involved in orthopedic, gynecology, general surgery, ENT, and plastics cases. No neuro or hearts. Very rarely OB. No call and No weekends. Learn more. MISSOURI: University of Missouri Department of Anesthesiology is seeking additional CRNAs to join their dynamic academic health center in mid-Missouri, home to the only children's hospital and Level I Trauma Center between St. Louis and Kansas City. A tremendous opportunity to join a group of energetic, self-motivated and culturally diverse faculty and staff with a strong commitment to support the growth in surgical volumes and expansion of surgical facilities. Learn more. An Israeli team of researchers questioned whether sedation with propofol—which is linked to higher patient satisfaction—would also improve colonoscopy outcomes and performance compared to standard sedation. To test the hypothesis, they focused on a cohort of nearly 45,000 colonoscopy patients who required sedation for the procedure. Compared with those who were sedated with benzodiazepines and opiates, patients who received propofol-mediated sedation were more likely to have an enhanced polyp-detection rate, cecal intubation rate, and terminal ileum-intubation rate. While the results suggest a robust association between propofol-mediated sedation and better colonoscopy performance and indicators, the investigators acknowledge the need for randomized trials to validate their findings. From "Propofol Sedation in Colonoscopy: From Satisfied Patients to Improved Quality Indicators"
Clinical and Experimental Gastroenterology (02/26/19) Vol. 12, P. 105 Abu Baker, Fadi; Mari, Amir; Amarney, Kamal; et al. Evidence from 26 randomized controlled trials suggests that intraoperative bispectral index (BIS) monitoring favorably affects certain outcomes, but markedly reducing the incidence of intraoperative awareness is not one of them. The systematic review and meta-analysis included 14,664 surgical patients who underwent BIS monitoring as well as 17,643 control patients. The data show that BIS reduced time to spontaneous extubation and to spontaneous eye opening, sped up release from the post-anesthesia care unit, and curtailed use of inhaled and intravenous anesthetics—although this last metric could not be quantified due to the level of heterogeneity in the individual studies. Additionally, while only 0.128 percent of the BIS patients experienced definite intraoperative awareness versus 0.25 percent of the controls who did, the difference was not considered statistically significant. Still, study lead Thomas Cheriyan, a resident at Augusta University Medical Center in Georgia, embraced the results. Presenting at the 2018 annual meeting of the American Society of Anesthesiologists, he said that "even though the [BIS] device doesn't statistically reduce the rate's intraoperative awareness, it might prevent that one devastating incident. And that makes it worth it to me. ... I see it as an added tool at our disposal to monitor patients and potentially improve outcomes." From "Meta-Analysis of BIS Monitoring Finds Efficacy and Nonsignificance"
The longer hip fracture surgery lasts for older adults, Canadian investigators report, the more likely they are to develop postoperative delirium. The finding comes from a retrospective population-based cohort study involving more than 68,000 patients aged 65 years and older who underwent the procedure between 2009 and 2017. A total of 7,150 of patients suffered postoperative delirium. After controlling for age, gender, comorbidities, and type of anesthetic, the researchers calculated a 6 percent jump in delirium risk for every 30 extra minutes of surgery. Reporting in JAMA Open Network, they also documented a correlation between general anesthesia and no general anesthesia in terms of risk, which climbed slightly with general anesthesia. Researchers not involved in the study viewed the work with some caution, citing several limitations—including the difficulty in identifying delirium records and the small effects. A pair of randomized, multisite trials underway in the United States and China, meanwhile, likely will offer more insight on the effect of anesthesia on postoperative delirium in this patient population, they say. From "Longer Surgery Duration May Raise Risk for Post-Op Delirium"
Anesthetic choices for deep brain simulation (DBS) surgery are complicated by the need for a fully awake and communicative patient. For this reason, Monitored Anesthesia Care is usually the first choice in this setting; but there are times when general anesthesia cannot be avoided. Other neurological surgeries have been performed successfully under the asleep-awake-asleep (AAA) approach with laryngeal mask airway (LMA); however, a secure airway is not always guaranteed with LMA. An alternative option, according to a team of neurophysiologists, is AAA and nasotracheal intubation-extubation-intubation (IEI), which requires a lower depth of anesthesia and can be performed on a conscious patient. The group reports in BMC Anesthesiology on their experience with three patients with Parkinson's disease who required general anesthesia for DBS surgery. During the initial asleep phase, general anesthesia and nasotracheal intubation were completed through standard procedure. The nasotracheal tube was pulled back right above the epiglottis under fiberoptic bronchoscope (FOB) during the awake stage for guidance for microelectrode recording, macrostimulation testing, and verbal communication. After monitoring was done, the team induced anesthesia with rapid sequence induction and utilized the FOB to reinsert the nasotracheal tube. Neuromonitoring was successfully completed, with all three patients later expressing satisfaction with anesthetic management. Secured airway with an endotracheal tube may be safer than LMA, potentially avoiding aspiration and reducing the risk of hypoxia. On the other hand, there is a risk of significant nasal bleeding—which could cause laryngeal irritation—or airway swelling from repeated instrumentations. More rigorous study is needed to clarify the pros and cons of nasotracheal IEI and AAA, the researchers conclude. From "Nasotracheal Intubation-Extubation-Intubation and Asleep-Awake-Asleep Anesthesia Technique for Deep Brain Stimulation"
Researchers at Beth Israel Deaconess Medical Center in Boston spearheaded a single-site study on postoperative delirium, which is known to affect older adults after cardiac surgery. A total of 120 patients aged 60 years and older were included in the trial, which randomized them to one of four different treatment arms after their procedure. The first group received postoperative analgesia with I.V. acetaminophen every six hours for 48 hours and postoperative sedation with I.V. dexmedetomidine for up to six hours after chest closure. A second group received I.V. acetaminophen for analgesia, with I.V. propofol as the sedation agent. The third and fourth groups received dexmedetomidine or propofol, respectively, plus placebo. The primary endpoint was incidence of postoperative delirium, which was observed in just 10 percent of patients treated with I.V. acetaminophen plus propofol or dexmedetomidine versus 28 percent of those treated with propofol or dexmedetomidine plus placebo. 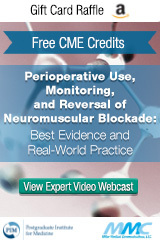 While the findings appear to favor postoperative use of scheduled I.V. acetaminophen in combination with I.V. propofol or dexmedetomidine, the Beth Israel team says more research is needed. From "Effect of I.V. Acetaminophen vs Placebo Combined with Propofol or Dexmedetomidine on Postoperative Delirium After Cardiac Surgery"
Journal of the American Medical Association (02/19/19) Vol. 321, No. 7, P. 686 Subramaniam, Balachundhar; Shankar, Puja; Shaefi, Shahzad; et al. Scientists designed a foot-controlled (FC) injection device in hopes of getting regional nerve blocks done more quickly on the battlefield and under other critical conditions. While regional anesthesia can effectively manage acute uncontrolled pain, outcomes can be altered when there are not enough hands on deck. A team from the University of Rochester in New York came up with a foot pedal interface, whereby left or right foot motion directs fluid flowing into the accompanying syringe pump in a forward (dispensing) or reverse (aspiration) direction, respectively. To assess the new equipment, they compared the time needed to achieve regional block using the pedal-based technique with the time needed under the one- or two-person strategy for anesthetic injection. Specifically, the researchers looked at total time to perform the block; time to visualize the block needle in the block phantom; time of the needle to target embedded in the block phantom; and time to injection. The team hypothesized that the FC method would be noninferior to the classic two-person method, a theory that was subsequently validated based on the prespecified outcomes. As such, the developers believe the device is a feasible option when using a different technique could be cumbersome, unsafe, or otherwise untenable. From "Non-Inferiority Trial of a Pedal Controlled Injection Device"
Journal of Pain Research (02/19) Vol. 12, P. 571 Aziz, Syed Reefat; Smith, Daryl I.; Mbaye, Rose M.; et al.